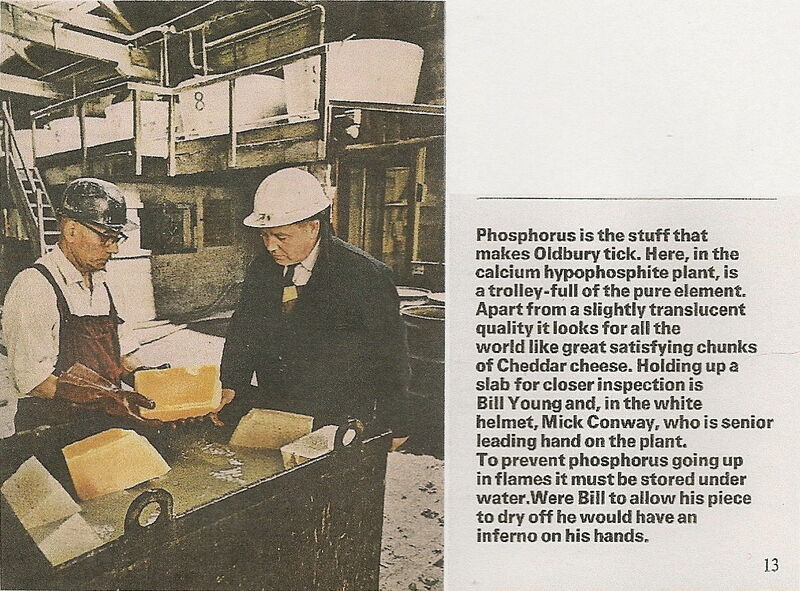 From its original plant in 1851, the Albright and Wilson firm grew from producing phosphorus for the match industry into an international manufacturer of phosphorus derivatives and other numerous chemicals. In 1948, their claimed year of the Rattlechain Lagoon site acquisition, Albright and Wilson became a public company and was able to finance a programme of expansion and acquisition which transformed it into Britain’s second biggest chemical manufacturer after ICI. 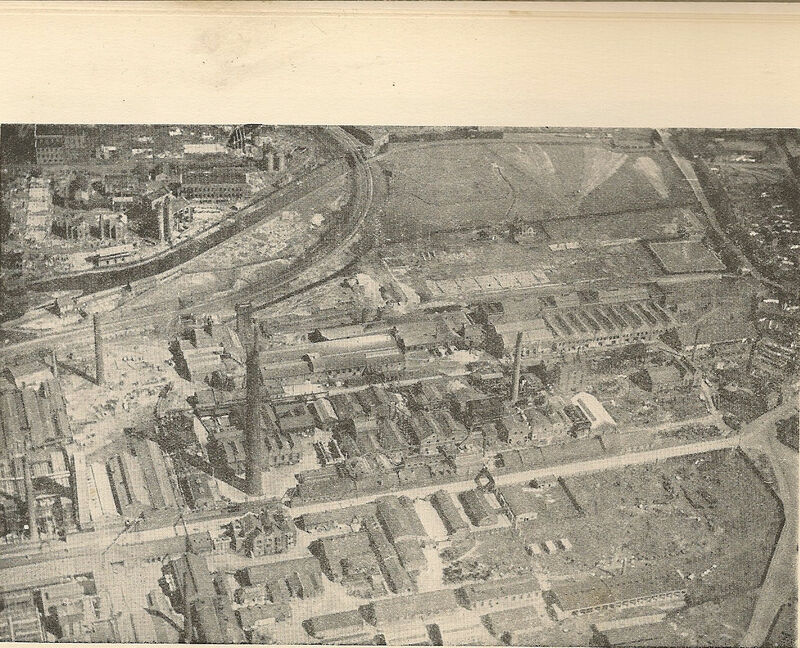 The plant was and still remains divided into two distinct named halves known as “Topside” and “Bottomside” which are split by the private road of Trinity Street which bisects the works site. “Albright and Wilson, The last 50 years.” By Hugh Podger ISBN 1 85858 223 7 Brewin Books 2002. Both of these books are written by former Albright and Wilson executives and are therefore largely sympathetic to the role that the company had in the area and their later worldwide growth, but gloss over their less impressive public relations episodes involving health and safety and waste management issues. 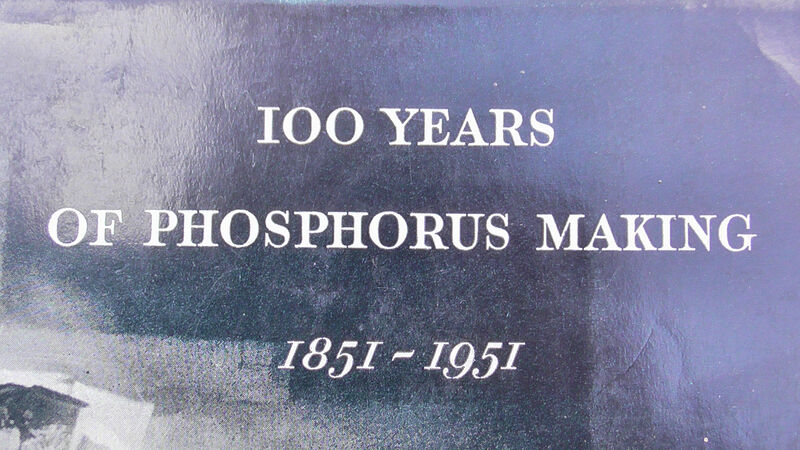 Another source of information carried out in 1961 entitled “Survey of a chemical group” by C.D Coppard, also yields interesting facts concerning the company at this time. 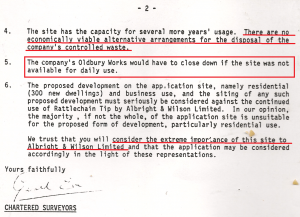 It is interesting to note that there is not a single mention of the acquisition or early development of Rattlechain lagoon or “Mere” as it has sometimes been refered to by Works management who were employed by Albright and Wilson during its final days. There is no mention of it directly by name in either of the two books about the company history. 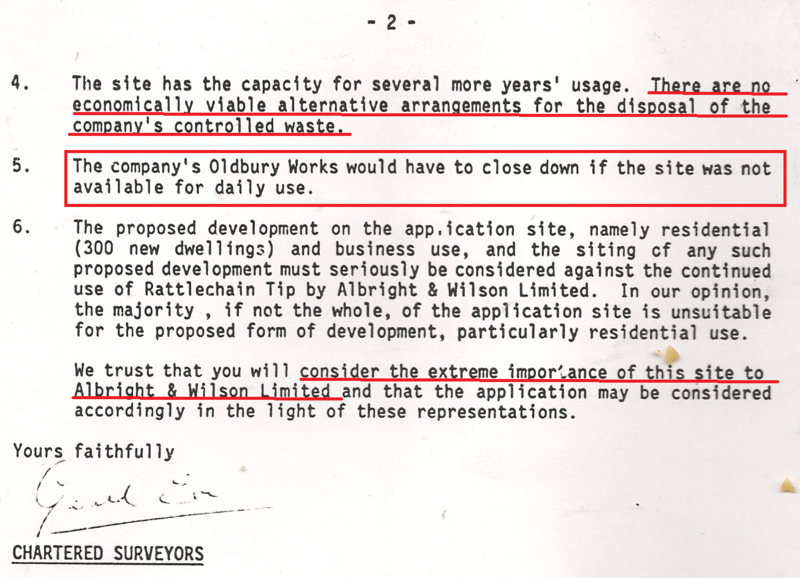 In fact there is no mention of how they dealt with waste at all; quite surprising when in later years the company attached a value of Rattlechain being “vital” to safeguarding jobs at the plant given that it was a necessary end dumping point for the waste stream of their production activities. Despite the past works management being initially proud and boastful of their war record it now appears that the current set up and many Government agencies would like to pretend that it never had happened. This will also be evidenced throughout this study; where denials, omissions of information and deception have clearly been found by us we will not be so remiss with this information. 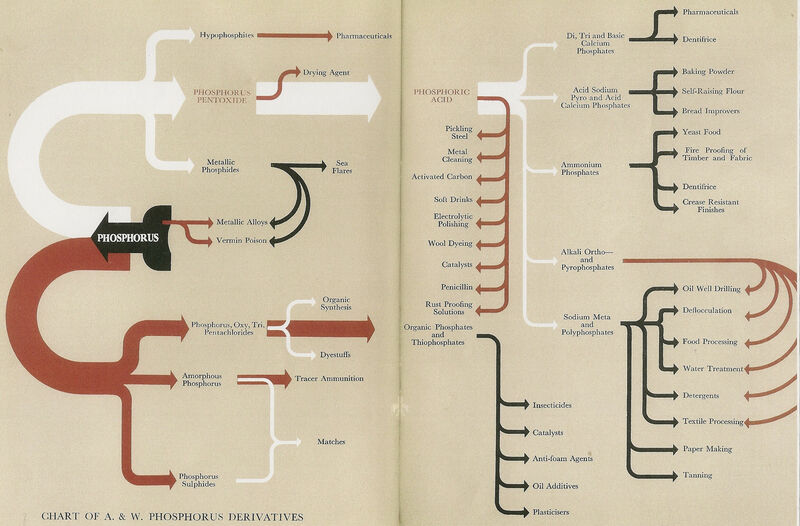 A flow chart of products being made at Oldbury around 1951 from the Threlfall book is shown, showing how phosphorus was the central building block of operations.